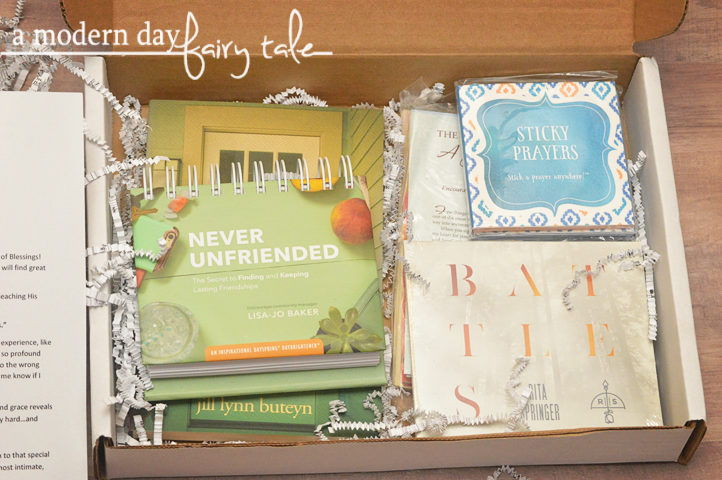 I love a good subscription box, don't you? So often when we make our way to the mailbox we are greeted by nothing but bills. More people wanting more money... where's the fun in that!? But a subscription box? A new box of goodies that arrives each month with new surprises--- it's like having a birthday every single month. Certainly makes going to the mailbox a lot more enjoyable, doesn't it? There are many great subscription boxes out there. Some offer you samples of the latest and greatest beauty products. Some offer fun cooking supplies and recipe inspiration. Some offer craft supplies to keep your projects new and fun. No matter your hobbies, your likes or your dislikes, there truly are subscription boxes for every one! 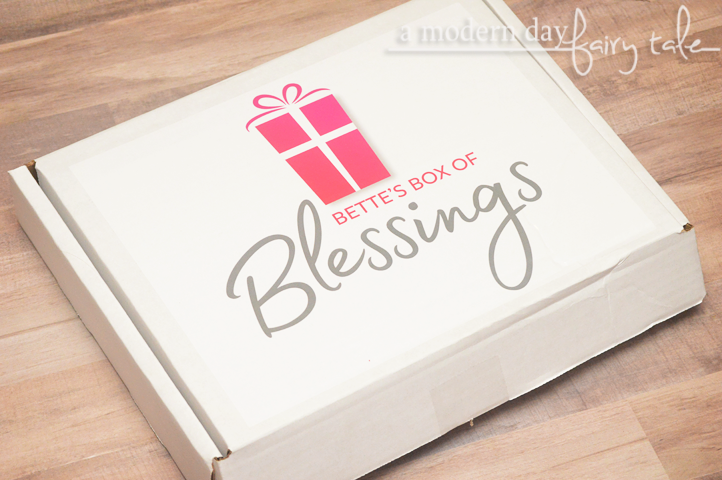 Today I'm excited to be sharing a new subscription box that I am absolutely loving: Bette's Box of Blessings. 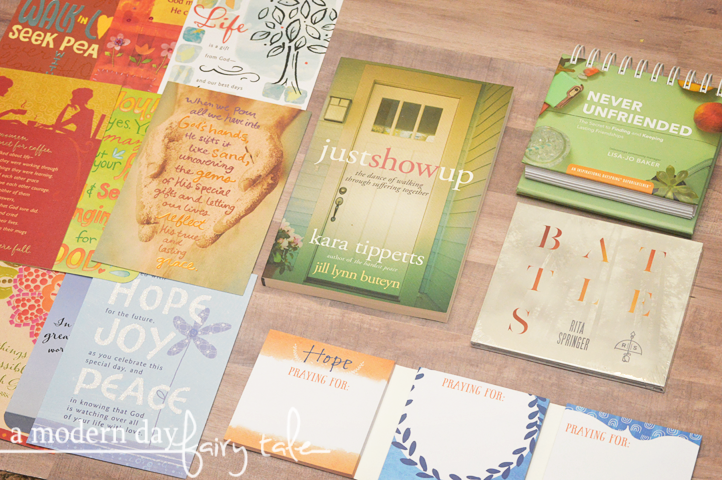 Each month Bette's Box of Blessings will contain Christian resources that will help you grow and share your faith. Every item in every Box will not only be a blessing to you, but each item also makes for a great gift that can also be a blessing to your family, friends and acquaintances. The best part? Each Box has a retail value of over $60, offering you a significant savings when you sign up. Sign up today! A new Box of Blessings ships every month by the 21st. Every item in this box perfectly seemed to incorporate that theme of friendship. The book is one that I had personally read before, and truly is a must read on the subject. I have highly recommended the book to others in the past, so it was great to receive a spare copy to pass along. Part of the fun of this Blessings box, I was able to pass on the blessings to others. Never Unfriended is another great book about friendship that I had read and loved so I very much enjoyed the perpetual calendar based on the book. Each day we are given wisdom and scriptural references all about friendship. It's a great reminder for yourself, or another great one to pass along to someone who could use some encouragement. I was not familiar with Rita Springer before receiving this box, but as a Christian music fan, I am always on the search for great new CDs. I loved getting to try one out that I might not have reached for on my own otherwise...and I loved it! Praying for your friends is perhaps one of the greatest things we can do for them, so the included prayer sticky notes were a great addition. You can use these in your Bible, your planner--- even on your mirror to remind yourself to prayer for those who are important to you. Aside from that, they're also super cute. And finally, the cards! Another great way to pass along those blessings to your friends so that they too can get something aside from bills in their mail box. 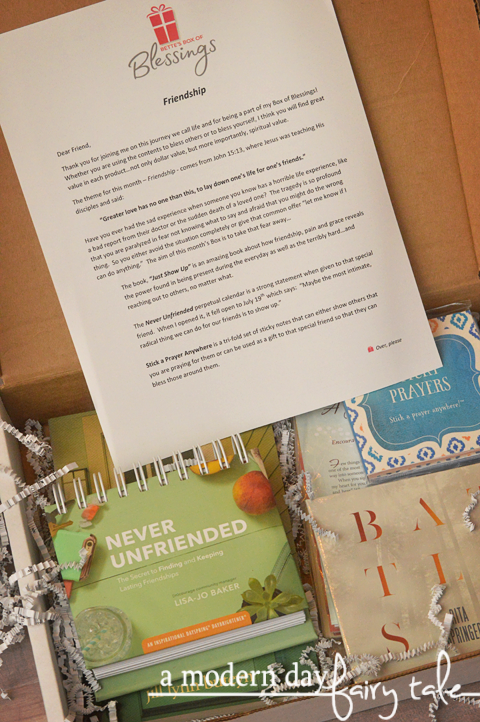 This box truly is a great way to strengthen our relationships with our friends, and through God too. When we build those friendships on a foundation of faith, I have found they tend to be deeper than many others in my life. Other boxes include topics of thankfulness, God's plan and more--- all filled with products aimed to offer encouragement and bring us each closer to God. With so much negativity, I think with all need that little extra bit of good news in our mailbox each month. At just $29.99 a month, this truly is a great deal--- as most boxes have approximately $60 value in product inside! You can buy month to month to check it out first, or prepay for up to six months for an even greater deal. Ready to get your own subscription started? You can learn more and get started here. And I know you all love a great deal as much as I do! Use the code FAIRYTALE to take $5 off your first box! Head on over to take advantage of this amazing deal. Do you love subscription boxes? What are your thoughts on Bette's Box of Blessings? How could it help you strengthen your relationship with God?